A little late because I’m crazy enough to move the weekend before GDEX, but here’s Exhibitor Update #3. Our Partner Keith over at Playvue has taken the reins on this one, so check out what he has to say about this year’s awards! POP THE BUBBLY AND TIP YOUR GLASSES, GDEX 2018 HAS NINE AWARDS THIS YEAR! In case you missed it, this year we will be presenting NINE (OMG!) awards as a part of GDEX 2018, including Best in Show, Art, ISE, Crowd Favorite, Most Accessible, Most Innovative and a few more at the Awards Ceremony on Sunday 9/30 at 6PM in the Main Theatre. So be sure to dust off your gowns and top hats, because it's award time! Register your game via the Playvue Developer Dashboard and be sure to select GDEX 2018 under Registered Events. 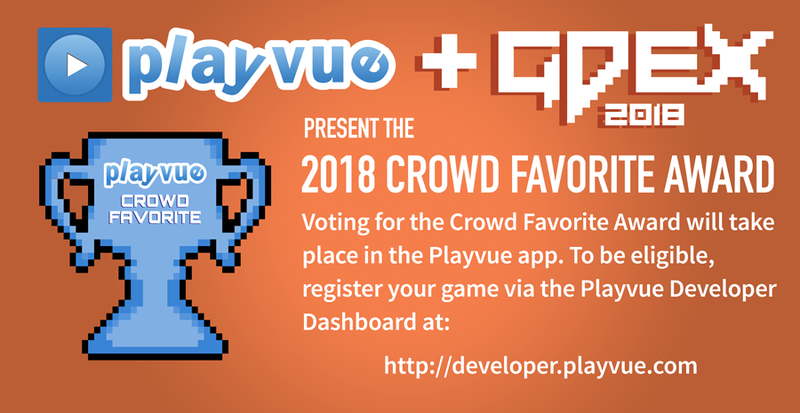 Once your request has been accepted, your game will appear under the Events > GDEX 2018 in the Playvue app and be available for voting come show time. This year, we've plastered every table and door we can find. But, we'll also be providing table displays and reminder signage for every game registered for voting (see #1). However, participants can only vote if they know your game is up for the award! So be sure to let them know to vote for in the Playvue app! Each attendee is allowed one vote for the Crowd Favorite Award. Voting will open Friday, 9/28 @ 7PM and end at 4PM on Sunday, 9/30. 4. WIN - WIN - WIN - WIN - WIN... you get the idea. Votes will be tallied and the Winning Game will be announced at the GDEX Award Ceremony on Sunday 9/30 at 6PM in the Main Theater. A representative will be on-hand from Playvue during the entire show weekend to help with an issues regarding the app, registration or voting. Before the show, if you have any issues, please email developers@playvue.com or reach out on Twitter @playvue. Good luck and see you at the show! So that’s all we’ve got! Get ready for a final email about load in and final GDEX info on Thursday! I’ll see you all on Friday! Exhibitor Update #4: GDEX Weekend!